The heated, ongoing battle over the Dakota Access Pipeline continued Tuesday as the billionaire CEO of the pipeline company Energy Transfer Partners issued a memo to employees and outside media promising to "reiterate our commitment" to the pipeline's construction. The memo (pdf) pushed against three federal agencies' Friday request that the corporation voluntarily halt construction of the pipeline. "We intend to meet with officials in Washington to understand their position and reiterate our commitment to bring the Dakota Access Pipeline into operation," Kelcy Warren wrote. Hours after the memo was released, two water protectors locked themselves to construction equipment outside Mandan, North Dakota, bringing construction on the pipeline to a halt. Riot police arrived and began arresting people around noon local time, according to firsthand reports, and ultimately arrested about 20 people -- including journalists and medics. Meanwhile, also on Tuesday, rallies in 100 cities in the U.S. and around the world called on President Barack Obama to stop pipeline construction once and for all. 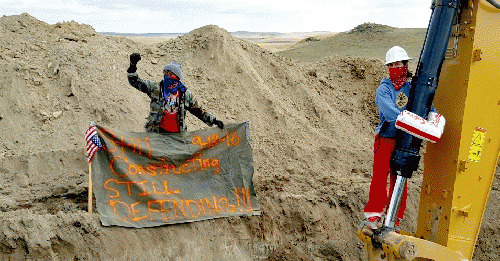 "We won't stop until they stop," wrote the Sacred Stone Camp, where the Standing Rock Sioux and allied Indigenous nations and supporters have gathered in protest of the pipeline's construction. The Standing Rock Sioux have long opposed the pipeline, fearing that a pipeline spill where the project is to cross the Missouri River -- upstream of the tribe's reservation -- will destroy the community's sole source of clean drinking water. In his memo, Warren claims that his pipeline company "worked to meet with the Standing Rock Sioux Tribe leaders on multiple occasions." The United Nations' Declaration on the Rights of Indigenous People calls for native groups to be consulted with and requires that "free, prior, and informed consent" be given by Indigenous people before any projects that affect their land and resources are undertaken.